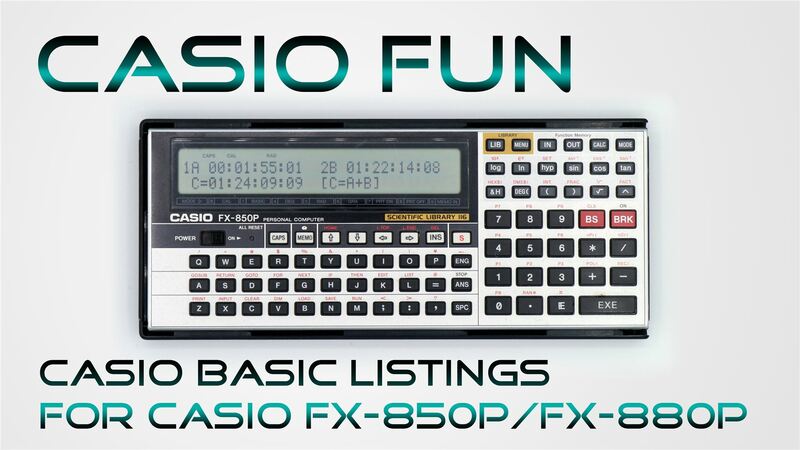 This is a SMTPE calculator program for the CASIO FX-850P/FX-880P. This Program is written in CASIO BASIC. Use it on you own risk. 172 IF ERT=1 THEN PRINT"TC ENTRY ERROR!" 1810 IF TCM<10 THEN INS$=":0" ELSE INS$=":"
1820 IF TCS<10 THEN INS$=":0" ELSE INS$=":"
1830 IF TCF<10 THEN INS$=":0" ELSE INS$=":"
This is a Tetris inspired game for the CASIO FX-850P/FX-880P. 2095 IF DIF=1 THEN ROWOP$=ROW$(OP)+" "
2105 IF P>2 THEN LAS$=MID$(ROWME$,P-2,1) ELSE LAS$="X"
2440 IF A<=HIG(0) THEN O1$=""
2450 IF A<=HIG(1) THEN O2$=""
6040 OB$(2,0)=B$+A$+" ":OB$(2,1)=" "+C$+" "
6050 IF C$=" " THEN OB$(3,0)=B$+" ":OB$(3,1)=A$+" " ELSE OB$(3,0)=" "+B$+" ":OB$(3,1)=C$+A$+" "
This is a simple game for the CASIO FX-850P/FX-880P. 5020 IF SOUND=1 THEN SOUND$=" 3-BEEP ON " ELSE SOUND$=" 3-BEEP OFF"